Art is more than just standing at an easel mixing paint and dabbing at a canvas with a brush. There are business aspects, financial elements, museum deadlines, gallery considerations and a whole host of minor issues that can take an inordinate amount of time, like what frames to hang the paintings in. It can all be draining, especially when it comes time to, you know, make art. For Arizona painter Howard Post, he's cuts through the clutter by focusing on one goal: “Make painting the priority. That's the fun part, and why we got into this in the first place,” he says. “Not that I dislike any of the other stuff, but the real buzz for me is laying the paint down, making new work. 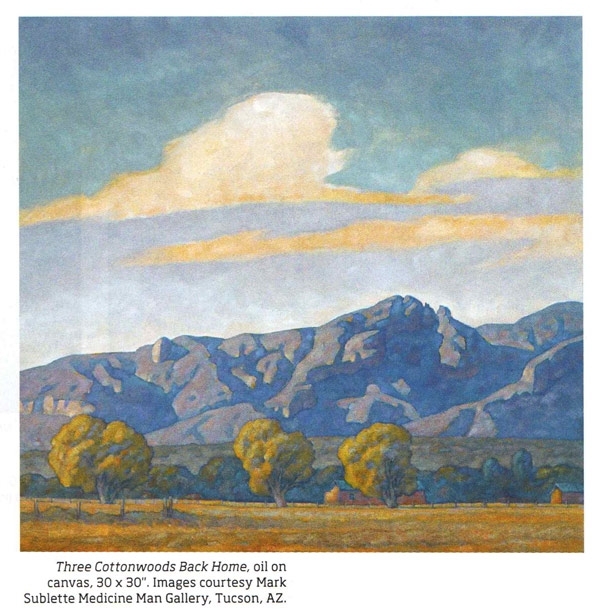 If you can do that and focus on that, it keeps you where you need to be.” This advice is apropos, and maybe a touch ironic, coming from Post since his 2018 calendar is likely to be historic: not only does he have several solo shows at galleries around the country, he also four separate museum exhibitions and retrospectives at museums such as the Booth Western Art Museum in Georgia; the Tucson Museum of Art and Desert Caballeros Western Museum, both in Arizona; and the Eiteljorg Museum in Indiana. His next gallery show will be opening February 23 at Mark Sublette Medicine Man Gallery in Tucson, Arizona, the painter’s hometown. 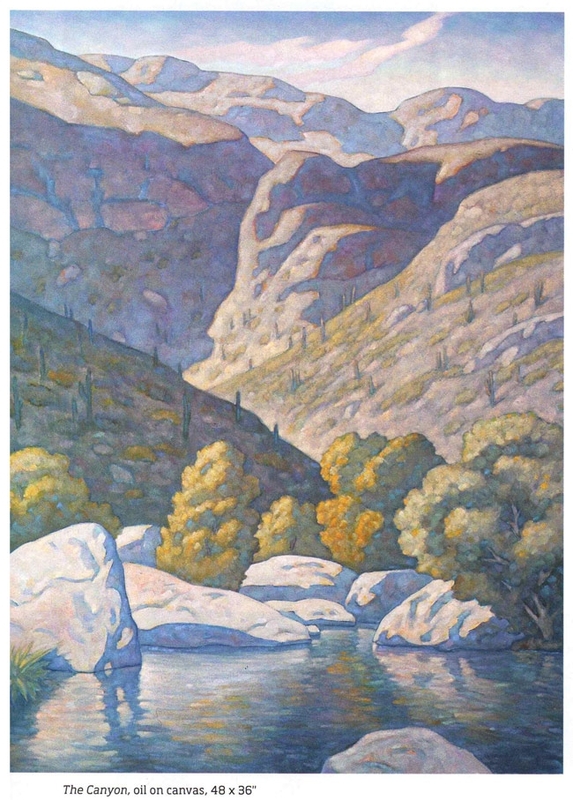 Many of the new works will be landscapes, with some that were inspired by places Post grew up in Tucson. 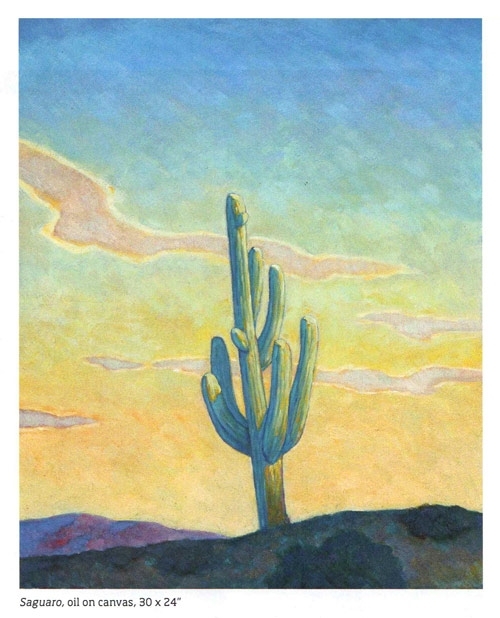 In the work Saguaro, Post paints a single cactus that is framed deep within a box of hazy blue sky, while in Riverbend he turns a view of a valley into an almost abstract arrangement of shadowed shapes and sunlit ridges with a small curve of a river winking from the mid-ground at center. ’’I just loved the squirrely lines of the river,” he says. If the dogs are hard workers, than Post is painting an attribute he knows all too well.